Guess who has the biggest range of magnetic bracelets in the world? I’ll put you out of your misery right away. The answer is Magnetic Products Store. And not only magnetic therapy bracelets. They also have magnetic necklaces, anklets, wraps, supports and sports magnets for athletes and golfers. 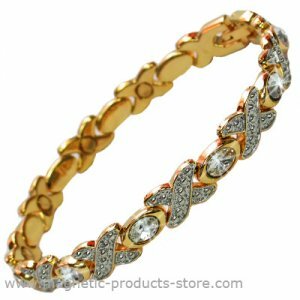 For example they have over a hundred different titanium magnetic bracelets, ranging from double strength, jet black titanium, 4-in-1 Bio elements bracelets and, of course, titanium bracelets with those wonderful Swarowski elements. They also have nearly fifty different copper magnetic bracelets including bangles, links bracelets, expanding bracelets and of course copper bracelets for arthritis. They also have a wonderful gemstone collection and some beautiful stainless steel bracelets. The real question is, why don’t we see more magnetic bracelets on the high street? After all, there must be a market for such beautiful products. Ah yes, there certainly is. But taking it to the high street is expensive and limiting. Even one shop involves heavy start-up costs and one shop only makes the bracelets available in one area. In contrast, the internet makes those same bracelets available everywhere.